When Daniel Kilchenmann arrived in the Okanagan Valley in 2008, he had a vision of building for Canadians the kind of timber frame homes that generations of families have enjoyed in his native Switzerland for centuries. He had no idea he’d landed in a corner of Canada home to finest timber in the world - BC Douglas Fir. So, European Timberframe Corp. was born in Vernon BC with these two cornerstones: a commitment to timberframing with European quality, and the best timber you’ll find anywhere - just a short drive from the beautiful Okanagan valley. Since then Daniel and his team have built dozens of spectacular timber frame homes, entrances, outdoor kitchens, gazebos, pergolas and more for homeowners and contractors in BC and across North America. 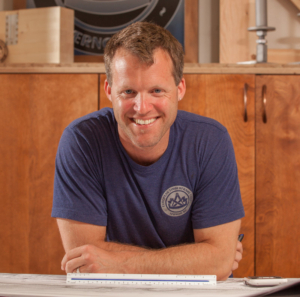 Daniel believes careful consultation with homeowners, architects, engineers and contractors is the best way to achieve the exact timber frame product people have been dreaming of. 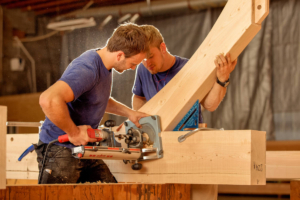 Having some of the best timber framers in Canada on our team, and using the world's finest timber framing tools from Mafell will results in a beautiful timber frame with superior precision. Our entire team puts their heart and soul into every beam, something a CNC machine will never be able to do, and you can see the difference. 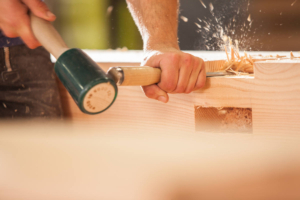 European Timberframe Corp. will always be passionate about creating post and beam homes using traditional timber framing, but we also offer contemporary designs, the most modern connectors and laminated or ‘glulam’ timbers. Today, our Canadian timber frame company still receives Christmas cards and invitations to barbecues from clients who are grateful Daniel knew just what they wanted. What does your dream timber frame home look like? As a teenager growing up in Switzerland, Daniel Kilchenmann thought he would be an architectural draftsman, and trained for that trade for several years. And then, seeing what was on the other side of his drawings—the majestic timber beams, each one ironed with a different grain, a different story—he began his timber frame apprenticeship and also studied wood construction engineering. After nearly a decade working in on both traditional and modern timber frame construction, and hungry for adventure, Daniel landed on the doorstep of the finest Douglas Fir in the world, in Interior BC, Canada. Here in Canada, most homes are stick frame, so people really, really appreciate a timber frame house. We say that we build for generations. This isn’t a home to flip. This is a family home, and if you take care of it, it’ll last forever. 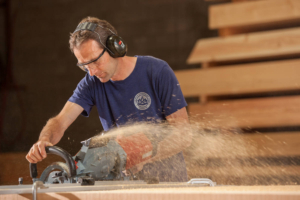 Making his home and opening European Timberframe Corp. in Vernon, BC, he discovered a renewed passion for his craft: Canadians aren’t quite as used to seeing stunning timber frame structures. Combining his love of timber framing and his field experience with his background in drafting, Daniel takes pride in carefully walking homeowners and contractors through entire process, from the initial design right through to raising day. Daniel has an uncanny ability to understand exactly what clients want and bring that vision to life. He’s also particularly proud of his team—their shared commitment to excellence and love for timber framing. 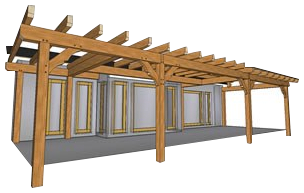 Daniel's custom structures are sought after by homeowners and contractors across BC and even the United States. Dreaming of your timber frame home? Sign up to our mailing list to receive info on our latest projects and news! You won't ever receive any spam and can unsubscribe at any time. Ready to make your dreams of a timber frame home a reality?